What procedures should I use to test my Information and Communications Technology (ICT) for accessibility? There are a variety of approaches available for different types of ICT, and each has their pros and cons. These pros and cons need to be assessed before adopting an appropriate procedure. In-Depth Answer: What procedures should I use to test my ICT for accessibility? 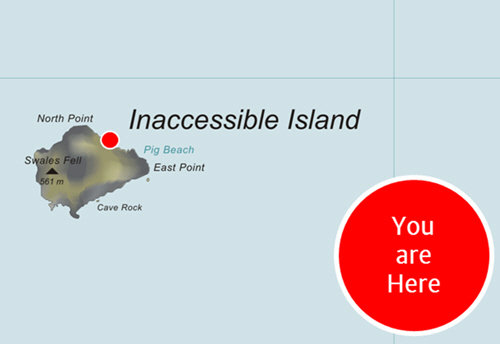 Are you living on ‘Inaccessible Island’? For your Information and Communications Technology (ICT), how do you know if you haven’t tested your products to see if they are accessible? Testing is one of the bedrocks of an accessibility program. Without testing, you can’t assess where you are now, and you won’t know when you’ve met the performance goals that you set for yourself. This article introduces some key concepts around testing, and provides a list of pros and cons for various testing approaches. The pros and cons should be evaluated first, and then links to available test processes are provided at the end of this article. Quality Assurance (QA) entails adding checks throughout the build and test phase of product development. Introducing appropriate QA checks throughout development reduces the likelihood of having a completed product that does not meet identified user needs. Quality Control (QC) is a final step at the end of production, performed before the product is packaged for delivery to the user (customer). A high number of QC rejections can occur as a result of poor implementation of QA throughout development. If products are delivered to customers after failing final QC checks, the number of problems experienced by end users is likely to be higher than if those products were rejected for delivery. For any accessibility test approach, a key question is whether it can be applied as part of QA during product development, and QC at the end of development. Necessary accessibility fixes are easier, less costly, and more likely to be addressed if they are caught during QA than if they are caught only at the point that QC takes place. As with many other aspects of product development, there is a difference between standards conformance and usability. For example, if an electrical gadget has to work at 240 volts, it can be tested according to technical standards with appropriate test tools, and if it is within acceptable tolerances, it will pass those checks. Technical standards don’t tell you anything about usability. Usability testing is a process whereby products are tried out by potential end users, and test methods are employed by research and development staff to gauge how well the product operates for users, whether there are major or minor usability problems that should be fixed. Laws and standards in the US relate to the technical aspects of ICT accessibility; they do not relate to the usability of the product. For example, one US standard requires: “At least one mode of operation and information retrieval that does not require user vision shall be provided”. Note that this requirement does not say that the mode of operation be easy to use. This gives us a separation between testing for technical standards conformance and testing for usability. This article concerns testing for technical conformance with established standards for ICT accessibility, such as Section 508 and WCAG 2.0. Note: We have produced a related article concerning the other aspect, usability: How do I ensure my products work for people with disabilities? Manual Assistive Technology (AT). Employing AT—designed for use by people with disabilities to interact with mainstream technologies—as a testing tool. Such AT commonly includes screen readers used by people who are blind, screen magnifiers used by people who have low vision, and speech recognition used by people who are unable to use a physical keyboard. This testing involves persons skilled in the use of one or more AT, who may or may not have disabilities. Give to a group of users who have disabilities. Providing the ICT under test to people who have given disabilities, such as blindness, low vision, deafness, difficulty hearing, etc. This involves persons familiar with the use of their particular AT as a part of their daily lives. Manual Code Inspection. Examining the underlying code that governs how information is rendered by the ICT. For example, the code underlying software, or underlying the structure of an electronic document. Testers use a number of inspection tools that interact with the ICT under test in order to reveal the code to be tested. Automated Code Inspection. A tool or set of tools is programmed to automatically scan content, inspecting the underlying code elements. The results are tracked and errors listed at the end of the automated scan process. Manual setup and management of scan settings is required, but the scan runs without the need for human interaction. Combinations. The above test approaches can be combined to make specific test process. In the pros and cons table below we list two fairly common combinations (Manual Code inspection + Automated Code Inspection; and Manual Code inspection + Manual Assistive Technology). Other combinations are possible. Note: For some of the tests listed above, the primary approach may be supplemented by individual test elements that use a secondary approach. For example, AT may be used as the primary means to gauge the accessibility of a piece of software, but for testing color contrast, a code inspection tool may be employed as a secondary tool. Note: The percentages given above are intended to be indicative. The percentage given refers to use of both the primary approach and any secondary approach that is typically employed. Assistive Technologies (AT) are representative of those used by people with disabilities. Can be useful as a quality check at the end of the development process. Inconsistent results can occur between testers having different versions and different user preference settings of AT. AT testing is a niche skill, not commensurate with the tools and methods used by most programmers and developers (so AT is not useful for QA throughout development). Can be representative of use by target end users. Can be used as an additional usability check at the end of the development process. Very difficult to get consistent results (i.e., managing in terms of AT versions, user settings and user skills). Assessing use by people with disabilities is not the same as testing conformance with standards (so not useful as a conformance QA or QC check). The skills and tools required to find conformance errors with manual code inspection is commensurate with the capabilities of programmers and developers, so useful for QA and QC. High levels of consistency can be achieved between testers. Manual code inspection tools may be restricted to certain browsers and software platforms. A small amount of subjectivity is involved (e.g., assessing the quality of alternate text). Does not require manual tasks (beyond initial setup, and regular maintenance of settings). Can provide an continual / ongoing assessment of performance. Automated tools can typically only test less than half of applicable conformance test items. Usually only works once the product has been developed (so useful as an ongoing quality check for newly posted content, but not a QA or QC check during product development). Provides a quick check of whether accessibility issues have been addressed. Parser tools can typically only test less than half of applicable conformance test items. Manual Code Inspection covers the development process (QA & QC), and Automated Code Inspection provides ongoing quality checks for newly posted content. Cost-effective and high degree of conformance confidence. Managing two different approaches and ensuring personnel use both appropriately together can be a challenge. Disadvantages of both approaches still apply. Manual Code Inspection covers the development process (QA & QC), and the benefits of a Manual AT check can be realized as an additional QC step. Uses appropriate skills of team members (developers do code inspection, accessibility specialists do AT testing). AT testing should be redundant if code inspection testing is implemented well (code inspection can cover all conformance checks). The most complete coverage possible. High degree of certainty of conformance as well as usability. In most situations, completely impractical because of the costs and resources involved. Overkill, because all of the conformance checks can be covered by one of the approaches (namely manual code inspection). Testing Website Accessibility (from Colorado State University). A more selective list with links to test processes. Create Accessible Electronic Documents (from the GSA). A list for electronic document authoring that also includes a number of test tools for documents. The main companion to this guide is the article How do I ensure my products work for people with disabilities? Having a solid testing process can help facilitate a good procurement process. See I’ve been told to make sure the things I procure are accessible. How do I do this? The Support section includes links to subject matter experts who can help you identify and implement specific test processes. ‘Inaccessible Island’ by Chris M. Law & The Accessibility Switchboard Project. CC BY-SA 4.0. Cropped and modified from original: ‘Map of Tristan da Cunha Group, Southern Atlantic Ocean’ (Public Domain).